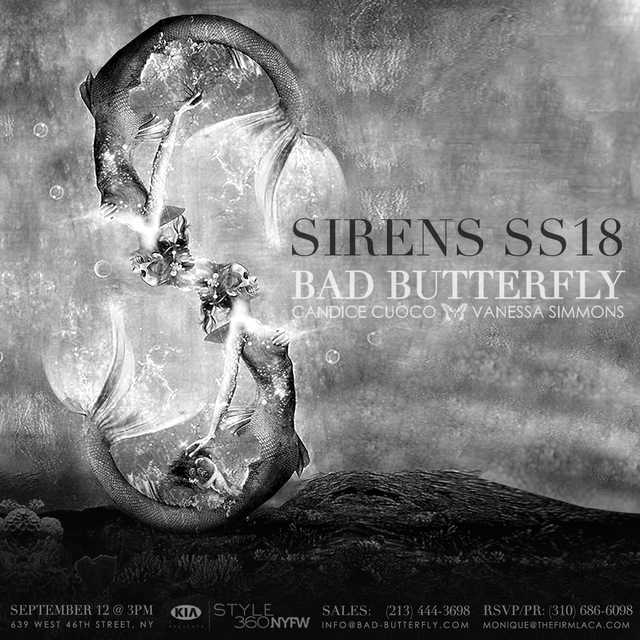 Project Runway’s CANDICE CUOCO debuted her new SS18 collection, SIRENS, at an exclusive NYFW runway event. Drawing inspiration from the sea, each silhouette features fabrics and embellishments that embody the ocean’s depths. Leather and silk are awash in fin-like ruffles. Textured fabrics and intricate details evoke mysterious aquatic creatures. Dramatic draping and sophisticated patterning reflect the waves and spiraling nautilus patterns of the sea. SIRENS bewitches and enchants, conjuring a mermaid’s dark seduction. I never liked rules, so I promised myself I would never create by them. Instead, I designed against them. 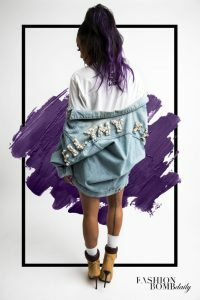 Fashion icon and Emmy winner Karrueche Tran shut it down in CANDICE CUOCO’s iconic Filthy Feminist ALTHEA jacket during an edgy Revolt TV x Fashion Bomb Daily video and editorial shoot. The jacket was one of the most memorable pieces from Candice’s BAD BUTTERFLY collection. Karrueche followed it up in a look featuring Candice’s studded bustier, coming soon to her new DEFIANT collection. 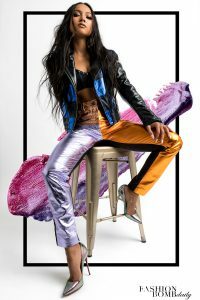 The interview with Claire Sulmers was photographed for Fashion Bomb Daily by Lance Gross and styled by celebrity stylist Bryon Javar, featuring makeup by Alex Echeverri and hair by Chris Dylan. 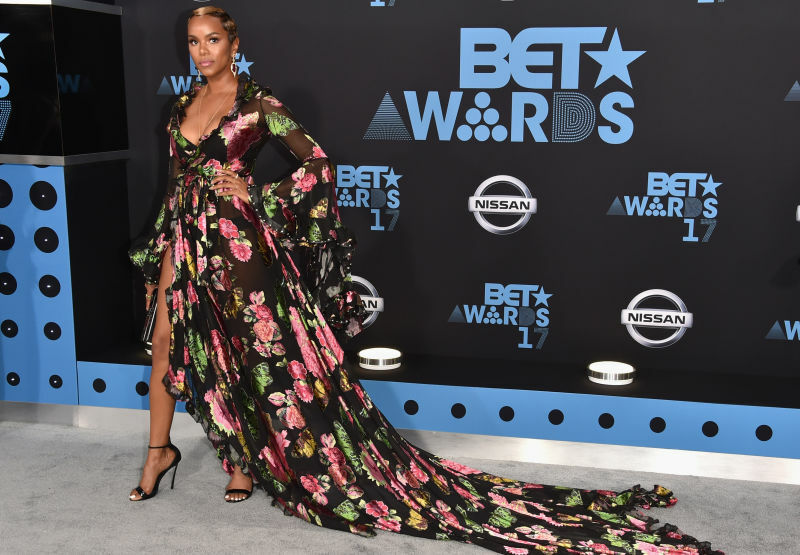 LeToya Luckett looked stunning wearing CANDICE CUOCO’s sheer butterfly wrap gown, CHARA, at the 2017 BET Awards. The look shot to the top of numerous Best Dressed lists, and was featured everywhere from Access Hollywood to Billboard Magazine and the New York Times. The dramatic ruffle and leather trimmed gown is available now from CANDICE CUOCO. LeToya Luckett rocked a gorgeous black and pink floral wrap dress by Project Runway season 14 finalist Candice Cuoco, complete with ruffle-and-leather trimmed bell sleeves and a dramatic train. Letoya Luckett gives us a sultry nighttime garden party look, like a little champagne mixer and then an evening in the boudoir. A black-based gown with a thigh-high slit? LeToya Luckett shows how to make florals feel groundbreaking. Cutting-edge fashion designer Candice Cuoco and hip-hop and fashion icon Vanessa Simmons announce the launch of their new swimwear collection, BAD BUTTERFLY SWIM. The collection is an extension of the pair’s BAD BUTTERFLY couture fashion line, which earned rave reviews as the finale of this year’s LA Fashion Week runway shows. Coming from a pair of powerhouses, it’s no surprise that the swimwear collection, like BAD BUTTERFLY before it, will celebrate women’s strength.